"Churchill Mark VII tanks armed with flame-throwers were known as 'Crocodiles'. Crocodiles towewd a two-wheeled armoured trailer containing 400 gallons of fuel for the flame gun. The link to the trailer can be seen at the rear of this tank. The fuel was pumped through a pipe beneath the tank, under pressure obtained from compressed gas cylinders, to the flame gun in the fron of the hull. The fluid was ignited as it left the flame gun, which had a range of 100 yards. 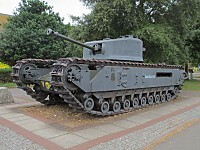 This tank has been given the markings of a Churchill Crocodile of C Squadron, 141st (The Buffs) Regiment, Royal Armoured Corps, which landed in Normandy on D-Day. Two troops of C Squadron took part in the initial assault on Gold Beach. The markings include the circles that were the tactical sign of C Squadron, and the Bull's Head insignia of the 79th Armoured Division. The tank was purchased from Pounds Marine Shipping of Portsmouth in 1988. 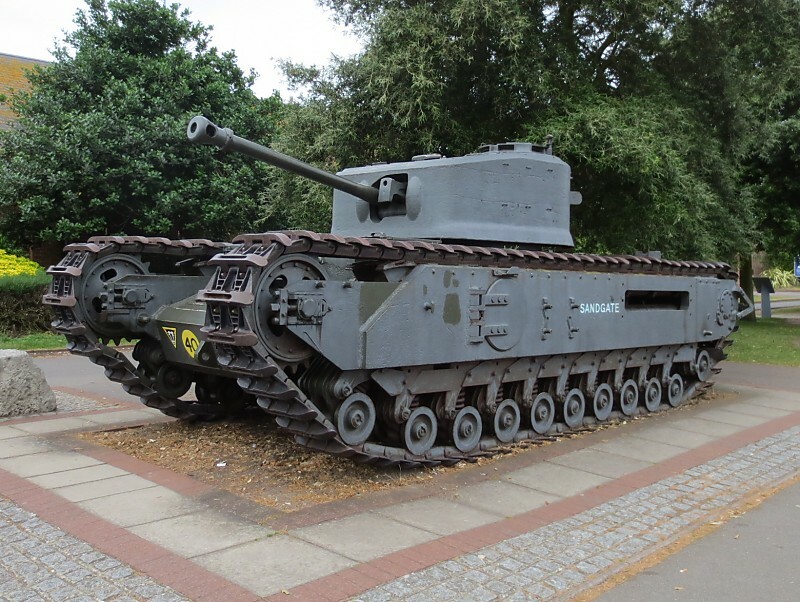 It was restored for the D-Day Museum with the help of the Solent Branch of the Military Vehicle Conservation Trust, and former members of the 141st Regiment"
The memorial to the 141st Regiment R.A.C. inside the D-Day Museum.